I am addicted to film, but I am also crazy for documentaries, and travel videos. 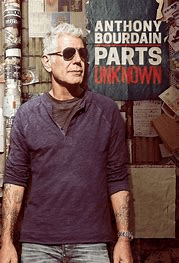 My husband and I are addicted to Anthony Bourdain’s Parts Unknown, and I think you should be as well. Here is a sample of how great this show is! Anthony was an eccentric chef who could not be still, and was always on the go. He was also an intellectual, a writer, an incredible host, a bit of a cynic, and a bleeding-heart Liberal. Thank goodness! His career as a writer, journalist, film presence, and traveler took him all over the world. Not only did he go to sample the ethnocentric foods of all Nations, but he went to meet the people. He sat, visited, ate, and enjoyed life with people from diverse backgrounds. He sat with the rich and the poor, the young and old, the famous, and the untouchables. He never refused hospitality, and never criticized a meal. He was always respectful of local customs, and always willing to learn, and adapt. He could talk to anybody, and people fell instantly in love with him. He was always able to, through translators, bridge the gap between peoples, and connect with whoever he met. Why he was not an ambassador for government, I will never know. His show taught the lesson that all people are the same no matter what cultural things separate us, and that everybody deserves to be valued and heard. This reveals the magic of how interconnected we all are, and how we are all citizens of the same earth no matter what. This show speaks for itself, and the fact it was cut short by Anthony’s tragic death is beyond a travesty. It’s currently streaming on Netflix. Watch this show, and learn about other people. See how much we share in common, no matter what our differences.